As seniors at Mahopac (N.Y.) High School in 1990, all students in Mr. Eric Height's honors English class were asked to write a 20- to 30-page thesis on a subject deemed significant to the world's well-being. Jonathan Powell, my best friend, waxed on the rise of Federalism. Daiji Takamori, the smart kid two rows up, examined early-19th century presidencies. Melissa Kounine covered Susan B. Anthony. Jon Kozak looked into Einstein's more obscure theories. Scott Choy argued for the redistribution of currency. Jen Perrotta debated the merits of higher education. My paper would cover a phenomenon unlike any other: a revolutionary idea that caused countries to battle, planets to shake and dogs and cats to fall from the sky at alarming rates. It would alter the globe. Alter the universe. Turn boys into men and men into boys and so on and so on. My opus' title: The Downfall of the USFL. We're guessing that Steve Young didn't receive all of the $40 million owed to him by the Los Angeles Express. Ah, the United States Football League. Just writing those four words causes my eyes to mist. Especially now, on the 20th anniversary of the end of what was  hands down  the greatest sports endeavor to ever grace mankind. While millions of Americans blankly stare at their TVs each Sunday to watch yet another jarringly dull battle between the Browns and Bengals or Raiders and Chargers or (egad) Jets and anyone, I lie alone under the covers, begging God to smite T.O. and Tom Brady and Tiki Barber and bring back the Boston Breakers, who moved to New Orleans to become the New Orleans Breakers, who moved to Portland to become the Portland Breakers who, well, you get the idea. For those too young to remember, the USFL came into being in 1982, when a handful of rich businessmen with free time decided the galaxy needed  more than anything  spring football. From the moment it first began play in 1983, the USFL was everything the NFL was not: weird, wacky, bizarre, unpredictable, unpretentious, groundbreaking and goofy. There was the swapping of rosters between the Chicago Blitz and the Arizona Wranglers. There was Steve Young signing a then-ludicrous 10-year, $40 million contact with the Los Angeles Express; Steve Spurrier coaching the part-Burt Reynolds-owned Tampa Bay Bandits. Buses broke down, charters never arrived, players vanished, coaches never showed up, pregame spreads were peanut butter and water. And yet, the USFL took a novel idea (spring football played by unjaded men) and  however briefly  found legitimacy. On May 24, 1982, just two weeks after the league's introductory news conference, ABC and ESPN agreed to a $13 million deal with the USFL. Within days, some of the sport's top names were hired as coaches  Chuck Fairbanks with the Generals, George Allen with the Chicago Blitz, Red Miller with the Denver Gold. On Aug. 5, Tim Wrightman, an All-American tight end from UCLA, became the league's first player, signing with the Blitz and opening the gates to a flood of personnel. The USFL never issued a direct verbal challenge to the NFL, but its intentions were obvious from the get-go: send Grandpa to Kevorkian's lair. This became clear on Feb. 23, 1983, when Heisman Trophy winner Herschel Walker inked a three-year, $3.9 million deal to play for the Generals. When, three days later, the Michigan Panthers signed All-American receiver Anthony Carter from the University of Michigan, the obscure turned obvious: The USFL was here to fight. 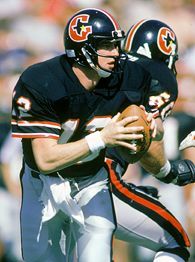 Future Hall of Famer Jim Kelly threw for 9,842 yards and 83 touchdowns in two seasons with the Houston Gamblers. 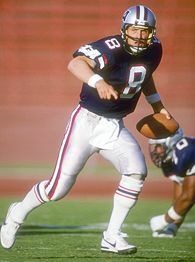 In its three years of existence, the USFL thrived as a pigpen for an odd mixture of top collegiate stars (Doug Flutie, Mike Rozier, Jim Kelly, etc. ), NFL washouts (Chuck Fusina, Vince Evans, Matt Robinson) and All-Pros lured by the phat wads of cash dangling from afar (Gary Barbaro, Raymond Chester). Was the overall play equal to the caliber of the NFL? Probably not. But, as former Birmingham Stallions quarterback Cliff Stoudt recently told me, "We had a legitimate passion to succeed. And we were sort of revolutionary." Of course, the league didn't last. Starting in 1984, the owner of the Generals  some wealthy fella by the name of Trump  began urging his peers to move the league to a fall schedule to directly take on the NFL. It was a crummy idea. A horrible idea. A nightmarish idea. Worst of all, a greedy idea. By all accounts, Trump's goal was not to help the USFL, but to force a merger. The desperate USFL wound up filing an antitrust suit against the older league, claiming it had established a monopoly in regard to stadium venues and broadcasting rights. The good news: The USFL won the case. The bad news: It was awarded a $1 judgment, tripled as mandated by federal antitrust law with 76 cents in interest tacked on  a total of $3.76. Almost as soon as the verdict came down, the USFL announced it would suspend play for the 1986 season. I remember hearing the news, crying into my soda pop and thinking, "Damn, I hope they return pretty soon." 2006: I'm not gonna lie. I'm starting to lose a little hope. Every so often, however, the USFL rises again. The next time you're watching sports, and a commercial for Sony or Panasonic comes on, look closely at the TVs that are being peddled. Because the USFL copyright has long since expired, the players pictured are almost always Generals and Bulls and Wranglers. Sure, it's only for a second or two. But sadly, it'll have to do. Jeff Pearlman is a former Sports Illustrated senior writer and the author of "Love Me, Hate Me: Barry Bonds & the Making of an Antihero."